Since the late 1970s, the Air Quality Research Center has been a leader in the characterization and analysis of the microscopic airborne particles that cause regional haze, the kind of air pollution that impairs visibility over widespread areas. UC Davis has been operating the Interagency Monitoring of Protected Visual Environments (IMPROVE) network since its inception in 1988, and we have demonstrated our ability to operate the network and analyze samples efficiently, reliably, and economically. Sources of regional haze are notoriously difficult to pinpoint because this kind of pollution is almost always caused by an accumulation of emissions from numerous sources scattered over a broad region. By developing equipment, procedures and programs to collect, characterize, measure and analyze levels of particulate matter that contribute to regional haze, the AQRC has been making important advances in global efforts to reduce this serious problem. The AQRC launched its first large air quality project in 1979, designing and installing 40 particulate matter sampling stations in eight states. This pioneering effort, funded by the Environmental Protection Agency, helped establish baseline levels for airborne particles at numerous sites. In addition, the AQRC's analyses of trace elements in the collected samples supported efforts to associate visibility degradation at each site with specific types of pollution-emitting sources. 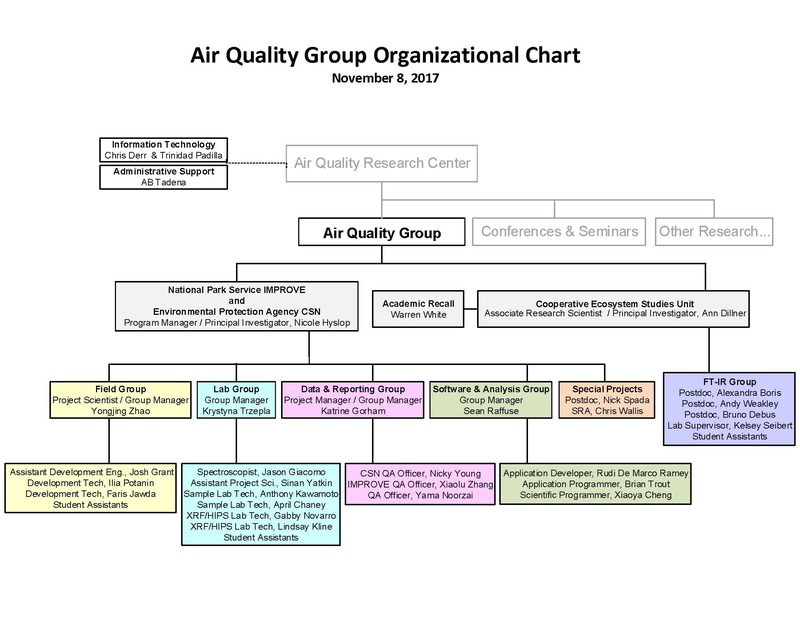 In 1985, when the EPA initiated IMPROVE, a much larger air quality project, it turned to the AQRC for the design, operation and quality assurance for the work. 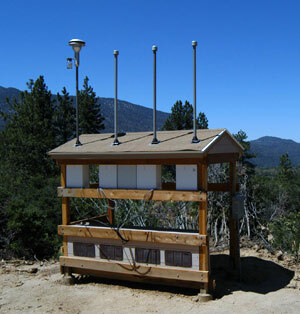 Since the program’s inception, the AQRC has been the only contractor for this nationwide effort to monitor visibility impairment in the country’s national parks and wilderness areas. We now manage two networks monitoring the air quality across the country, CSN (Chemical Speciation Network) and IMPROVE. You can see the locations our monitors are across the country in the map below. Currently, our laboratory is equipped for efficient handling and analysis of the large volume of filters generated in the IMPROVE network, comparable in size to CSN. All IMPROVE polytetrafluoroethylene (PTFE) filter analyses are performed on-site at UC Davis, including gravimetric mass, elements by EDXRF, and light absorption by hybrid integrating plate and sphere (HIPS) analysis. Over the years, we have developed and applied improvements to our analytical techniques and procedures, designed to enhance data quality. UC Davis offers outstanding expertise in EDXRF of PM samples. We have conducted extensive tests on our PANalytical Epsilon 5 instruments to characterize them fully for elemental analysis of IMPROVE filters. We have informed PANalytical of idiosyncrasies with their instruments that had escaped the notice of their engineers and others using their instrument for PM filter analysis. In recent years, we have produced EDXRF calibration standards that are (a) specially formulated for the low PM concentrations observed on IMPROVE samples, (b) produced by collecting known particle concentrations onto the filters used in the network, (c) prepared using the same samplers used to load these filters in the field, and (d) made with loadings similar to those observed on CSN filters. We offer extensive intellectual involvement with the measurements — well beyond simply operating the instruments — such that we publish our advances in the top peer-reviewed journals in the field. While data generated by the aerosol samplers are primarily used to monitor long-term trends in visibility, others have made use of the wealth of information made available by IMPROVE for a variety of investigations. These include searching for the sources of emissions that are causing air pollution at specific sites, and correlating meteorological data with statistical models and maps of IMPROVE data to track the long-range movement of pollutants from large emitters such as power plants and refineries.